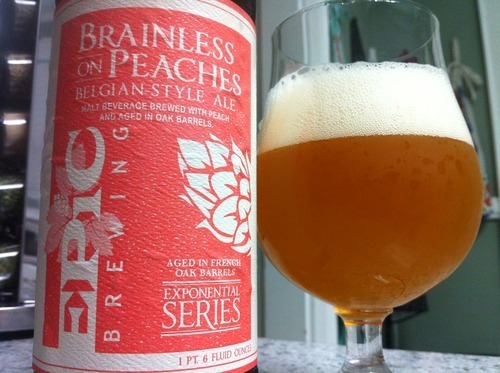 EPIC Brewing Brainless on Peaches | Drink. Blog. Repeat. Who knew that such great beer could come from the middle of Mormon country? EPIC Brewing – the stateside brewery, not to be confused with one of the same name in New Zealand – lives up to its name with some pretty big beers, especially in their Exponential Series. I was hooked about a year ago after trying their Green-Apple Saison, which was a great blend of fruit flavors and solid examples of the base styles. I had heard a lot of good things about Brainless on Cherries (review coming soon) and Brainless on Peaches, which blends EPIC’s Brainless Belgian-style golden ale with the respective fruits and then ages it in barrels. (In this case, it’s Frech Chardonnay casks.) It was hard to pick which to review first, but being a Georgia boy, I’ve got a soft spot in my heart for peaches, so I decided to spend an afternoon getting brainless. The beer has a hazy golden orange color, exactly what you’d expect a golden ale to look like. On top was a big two-finger bubbly, and while the lacing wasn’t very strong, the alcohol legs were. The nose didn’t do much for me. There was a bit of funkiness and some of the Belgian sweetness, but only a hint of the peaches along with kind of a musty smell from the oak. The fruit flavor was more of a sweeter jelly or jam peach smell than fresh peaches. There was definitely some booze on the nose, too. While the smell wasn’t great, the taste was much, much better. Big cheek-stinging sourness and scrubbing carbonation throughout the mouth. The peaches have a big pop on the back but settle away fairly quickly, replaced with an oaky and sweet taste on the back. It clings to the back of your tongue. Throughout is a big Belgian yeast characteristic and a bit boozy taste. The alcohol is definitely present, but its hard to keep this one as a sipper. While it didn’t quite blow my brain, Brainless on Peaches was still a solid beer. The sweeter Belgian characteristics was a nice contrast to the tartness of the fruit. I would have liked to see what it was like with fresh fruit instead of puree, but still, a solid fruit beer.